We would like to introduce you to the growing number of Virginia wineries operating in the Commonwealth and to our new website promoting these wines: Virginia Wine TV. The Commonwealth of Virginia is closing in on 200 licensed wineries, in which all are contributing to making fabulous wines and enjoyable destinations. On a fairly regular basis we will be releasing videos covering many facets of the industry; interviews with winemakers, the Virginia First Lady, and critics; discussions about grape varieties; as well as short entertaining segments such as this video and soon, on dog friendly wineries. Plus each video will contain a musical theme performed by a Virginia born or based musician. In this case, Larry Keel & Natural Bridge provide the score. Check back often for new video releases. 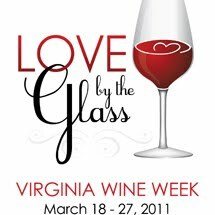 Many wineries, retailers, and restaurants will be participating in Virginia Wine Week, March 18th-27th. We ask these businesses to post their specials here in the comments sections. Cheers. Arcady Vineyard Wine Tours loves Virginia Wine Week! Saturday is booked, but space is available the rest of the week. Touring the wineries in Central Virginia just outside Charlottesville! Whew! Feels like we drank too fast...that was quite a ride! Great tune, great places. Exhale. Come to relax and sloowwww waaaay down here on Cobbler Mountain of Delaplane beginning June 4th with a "Soft Opening". Thank you for sharing your time & interest with Virginia Wineries. Cheers to the Luck O'the Irish from the McCarthy~Louden family at Cobbler Mountain Cellars. "Bail ó Dhia ort" (Good health to you) and "Sláinte chugat". (Sleep well)....after your tours! Wisteria Farm and Vineyard in Stanley will be hosting special wine barrel tastings of the 2010 vintage on Saturday and Sunday, March 19 and 20. In addition, they are partnering with Artisans Grill in Luray for a wine dinner on Saturday, March 19. Very nice production, very informative, and done in a manor that keeps your attention by using descriptions in wine making that could be understood by the novice wine drinker. Congratulation to Paradise Springs on their Governor's Cup Win. Small winery with a great future ahead. Keep it going. Buy Virginia Wine!! Todd, et. al. - great job! Looking forward to future videos. 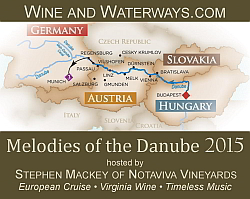 This is a great time in Virginia wine so you no doubt have a ton opportunities for content. Realize this is Virginia 'Wine' TV, but hopefully you'll consider an episode on Virginia cider. Although only two active cideries right now (Foggy Ridge and Albemarle), there are 4 more with licenses pending - will be interesting to see how Virginia cider grows. Frank, we plan to include cideries, meaderies, distilleries, and even an episode on Virginia breweries. I'll post a schedule on upcoming episodes. Thanks for the feedback. The Leesburg Town Council will be voting on the parking on King Street issue March 22. We need your help. Many of you have already sent an email to the council in support of our position to keep parking as is on King Street. Please, if you have the time send them another email and tell them to vote Tuesday March 22 to leave the parking as is on King Street. This is extremely important to many merchants on King Street and myself. The more emails that are sent, the better chance we have of retaining the parking and making it easier for you to park,shop, and enjoy all Downtown Leesburg has to offer. Send your email to council@Leesburgva.gov and tell your friends to do the same. Every email helps!! The email will go to the Mayor and all council members. They voted 4-3 to eliminate the parking on King Street last September.